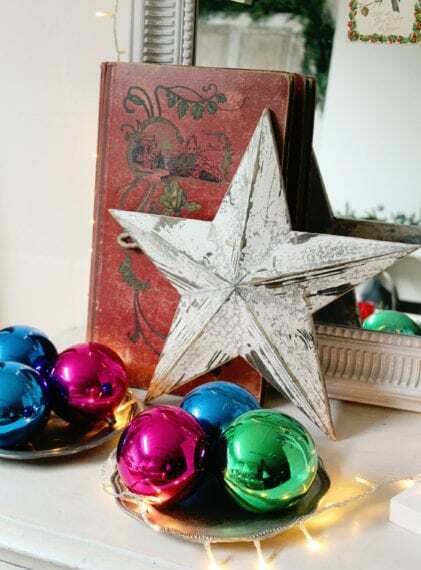 Christmas is my favourite time of year, and I absolutely love festive decorating. 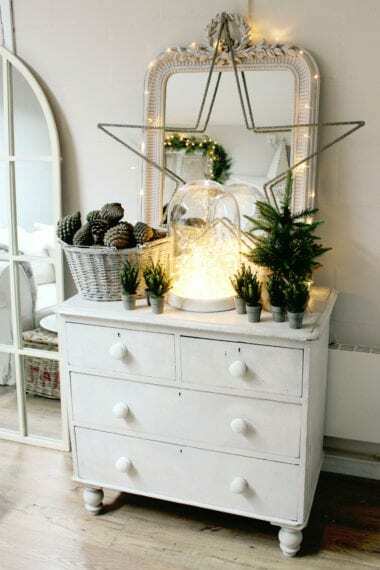 Twinkling fairy lights and greenery bring a touch of magic to the home, no matter what your style is. We decided to style two room sets for this post. 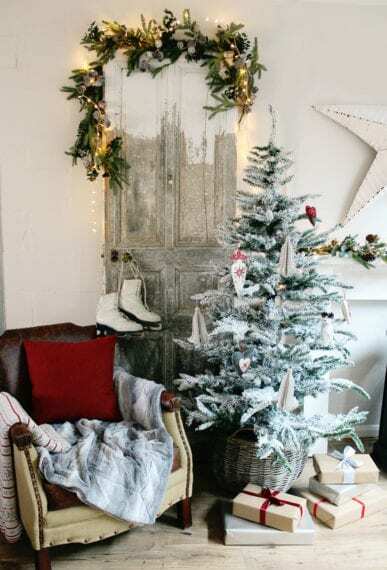 For the first one, we went with a very Scandinavian theme – lots of white patina in the form of gorgeous reclaimed doors, and antique skis, hide rugs, fake fur throws and chunky knit throws for rustic cosiness. 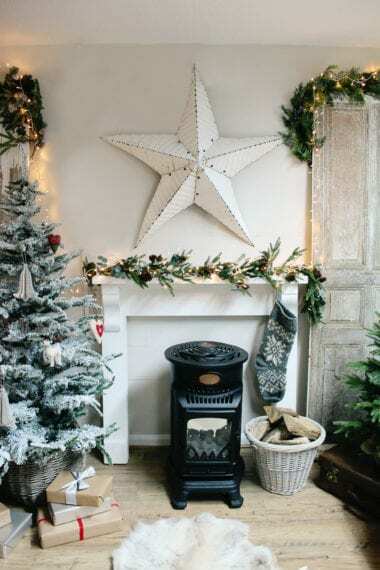 The stunning barn star looks absolute gorgeous as a focal point above the mantelpiece, which I simply covered with a lush greenery garland and fairy lights. 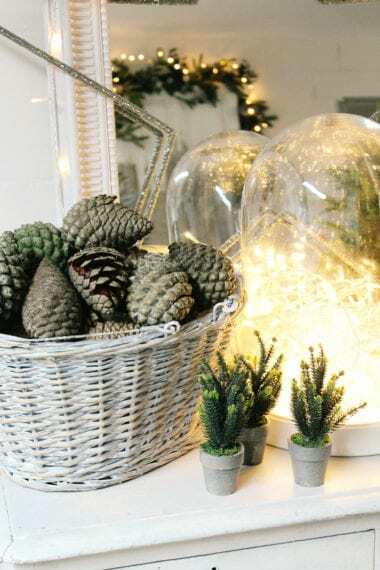 On the vintage chest of drawers I put together an elegant yet quirky vignette using mini Christmas trees, huge rustic pine cones stacked in a basket, and fairy lights in a large glass dome. For the second room set, we decided to go for white and lots of deep, rich red for a touch of Nordic elegance. 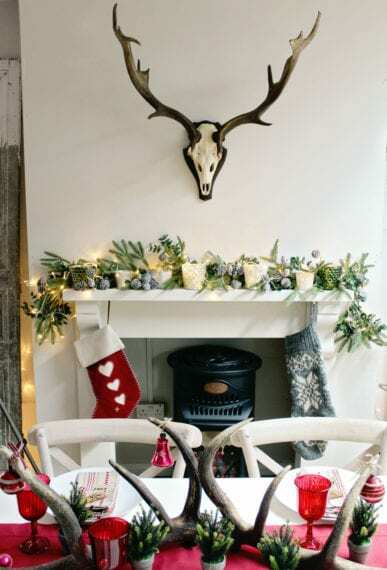 We hung these amazing vintage antlers above the fireplace, and laid out a beautiful table for lunch using lots of red accessories – table runner, glasses and vintage baubles. 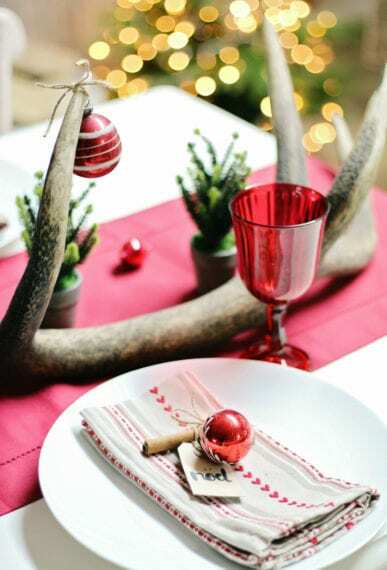 We made a simple but pretty table setting using brown kraft labels tied to a cinnamon stick and a bauble with twine, and for a striking table centrepiece, more antlers. 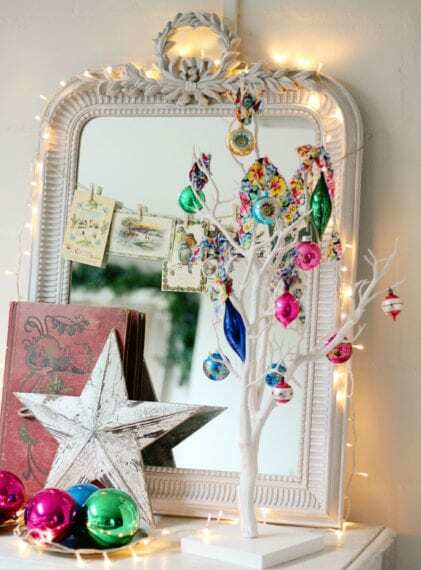 I put together a sweet vintage vignette with lots of colourful glass baubles displayed en masse on antique pewter plates or hung on a simple white tree (DIY a similar tree by foraging for twigs and smalls branches, painting them white and sitting them in a large, heavy bottomed vase. Put sand in the bottom of the vase to keep your branches steady). 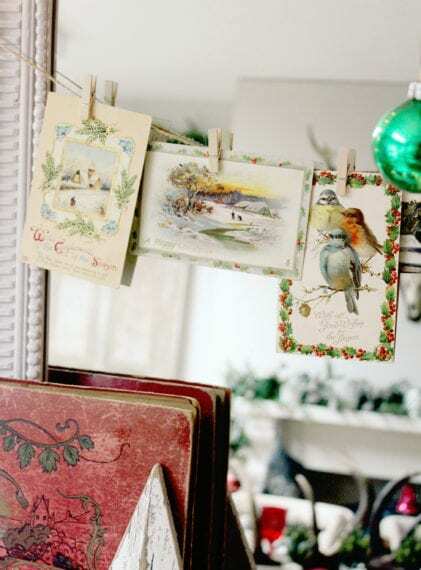 Beautiful old Christmas cards are displayed by using mini pegs to attach them to a twine washing line hung across a mirror, for a whimsically pretty display. I hope you all have a fabulous Christmas, and look forward to sharing more styling ideas with you in 2017!